School groups by appointment entry from 8.00 a.m. Dogs are only permitted in the Pan Pan café restaurant area (assistance dogs excepted). The Museum Lab and Kid’s Corner may be closed during special events. Buses can park directly in the forecourt “Klangturm St. Pölten.” In this case, coming from the S 33, turn right before the tunnel towards "Landhaus". Your passengers may of course disembark directly in front of the museum. Parking spaces for disabled visitors are located directly in front of “Klangturm St. Pölten.” To access these, do not drive down into the garage but – coming from the S 33 – turn right before the tunnel towards "Landhaus". The Museum is only approx. 50 meters away and can be accessed easily via a ramp. TIP: “nextbike” bicycle rental stations are located at the railway station and in the government quarter. Lower Austria is not only Austria’s largest federal province, its geography, people and events make it Austria’s historical heartland. Its eventful history spans the first traces of human settlement, the first recorded mention of Austria (“Ostarrichi”) in the year 996, the proclamations of the 1st and 2nd Republics, and the fall of the Iron Curtain through to the unification of Europe. The new House of History is open since September 2017 in Museum Niederösterreich. Discover Lower Austria’s ecological and topological diversity: a splashing stream leads you from icy Alpine glaciers to the mellow waters in the lowlands. Watch live fish, amphibians, reptiles, ants in giant aquariums, terrariums and a formicarium. You can safely examine the larger inhabitants of our meadows and forests up close, because they are displayed as preserved specimens. Visit our photo gallery to see what’s happening at the Museum Niederösterreich. You’ll be amazed how much our museum has to offer! In the Museum Niederösterreich shop you’ll find all products connected with our exhibitions as well as a large range of souvenirs that make perfect gifts to delight young and old. You can order our publications online, by email or by calling us at +43 2742 90 80 90 ext. 951 or ext. 955. Postage and packing EUR 6 (within Austria) and EUR 15 (to EU member states). TIP: The shop team would be delighted to put together personal gift assortments for you! By definition, “Pan-pan” is an urgency signal sent by ships or aircraft when passengers are at risk but not in immediate danger. It calls for immediate, preferential attention and assistance. This is exactly what visitors to Museum Niederösterreich can expect! They – and of course guests not visiting the museum- will indeed receive immediate preferential attention and assistance from Georg Loichtl and the Flieger Gastro team when it comes to stilling their hunger and thirst. With new menus every week, tasty salads and pastries, guests are made more than welcome and may well be tempted to stay longer than “urgency” dictates! Pan Pan and Museum Niederösterreich are also an ideal venue for professional events and private celebrations. We would be pleased to cater to whatever you wish to celebrate, from family gatherings to staff parties through to wedding banquets. We’re so versatile, we’ll always provide the perfect setting. Tuesday – Sunday 9.00 a.m. - 5.00 p.m.
How do I get to the museum by car? My navigation device can’t locate the address. How do I get from the railway station to the Museum, and how long does it take? Railway station–Museum: from the railway station, walk past the park house on the left, at the roundabout take the road to the right, walk past “Bischofsteich” and “Neugebäudeplatz”, turn left at the pizzeria to go down “Hammerweg.” Follow the signs to the “Kulturbezirk”, continue on past the “Festspielhaus” on the left, straight to Museum Niederösterreich. The walk takes approx. 15 minutes. Museum–railway station: From Museum Niederösterreich, walk past the “Festspielhaus” and follow the signs to the town center (“Zentrum”.) After you have crossed the “Neugebäudeplatz” and “Bischofsteich” you will come to a roundabout. Keep left, going past the park house, and you will see the railway station ahead. The walk takes approx. 15 minutes. Is there free parking round the Museum? Yes, there are several possibilities to park near the Museum. Underground parking: 1st hour is free, every further hour costs € 1.50, maximum € 7 per day. Free parking: on weekends/public holidays and between 6 p.m. and 5 am. H is an accessible exit leading directly to the entrance of Museum Niederösterreich. The ticket issued on driving into the garage does not need to be validated – simply have it ready on leaving! Buses can park directly in the forecourt “Klangturm St. Pölten.” In this case, from the S 33, turn right before the tunnel towards "Landhaus". Your passengers may of course disembark directly in front of the museum. Parking spaces for disabled visitors are located directly in front of “Klangturm St. Pölten.” To use these, do not drive down into the garage but – coming from the S 33 – turn right before the tunnel towards "Landhaus". The Museum is only approx. 50 meters away and can be accessed easily via a ramp. How do I get in and out of the underground garage to/from the Museum? H is an accessible exit leading directly to the Museum Niederösterreich. Where are parking spaces for disabled visitors? Parking spaces for disabled visitors are located directly in front of “Klangturm” St. Pölten. To use these, do not drive down into the garage but – coming from the S 33 – turn right before the tunnel towards "Landhaus". The Museum is only approx. 50 meters away and can be accessed easily via a ramp. Can I pay for parking at the Museum’s ticket desk? No, parking tickets can only be paid for at the ticket vending machines in the underground parking garage. The garage is operated by another company. Do museum visitors get a discount for the underground parking facility? There is a discount, but only for the day ticket. This means that if you are planning to park in the underground facility for more than 5 hours, you pay €4 instead of €7 for the whole day. These discounted tickets are available from the Museum Niederösterreich’s ticket desk. Why is there no proper signposting in the underground parking garage showing visitors how to get to Museum Niederösterreich? The garage is operated by another company, therefore Museum Niederösterreich has no influence over the signposting. Please follow the signs “Richtung Festspielhaus / Museum Niederösterreich.“ Then use exit H, which will take you directly to the museum. . Approximately how much time will I need to visit the Museum? To assess how much time you will need for your visit, please use the planner provided on our homepage. You can mark the displays and exhibitions you wish to see, and the program will give you a time estimation. We recommend 60 to 90 minutes to walk around each display. Except for a few exceptions (cave and glacier) the entire museum is accessible. Entrance/foyer: accessible access to the main entrance, double glass doors (clearance width 200 cm). Display area: all collections and exhibits (with the exception of the cave and the glacier) are accessible. Restrooms: accessible toilets are clearly designated. Are dogs allowed in the display area? No, dogs are only allowed in the foyer and in the Pan Pan café restaurant. Dogs are not allowed into the display areas, with the exception of assistance dogs (guide dogs, hearing dogs.) These may of course accompany you into the display areas! No. Our opening times are: Tuesday to Sunday and public holidays from 9 am to 5 pm, closed Mondays (except if a public holiday.) School groups can be admitted to the museum by appointment at 8 am. Are there play areas for children? Yes, there are play stations for children in the Museum Lab and for children under 5 we provide a play corner. In addition, in the Nature discovery zone (at the Danube Basin level) a slide has been integrated into the wall leading down into the cave. Please note that access to the Museum Lab may be restricted during special events. For more information click here. Does the museum provide child supervision? No, parents remain liable at all times for the safety and behavior of their children during our children’s programs. Our cultural educators are only responsible for providing creative activities and imparting knowledge. For what age are the creative stations suitable? In principle, our children’s program is designed for children over 5 years old. The younger the children, the more assistance they will need from their adult supervisors during the arts and crafts activities. From what age do children pay admission? At Museum Niederösterreich, children and youngsters between 7 and 18 years of age pay admission. Are annual tickets available for adults or children? No, there are no annual tickets for Museum Niederösterreich. However, adults and children with a Niederösterreich Card get free entry as often as they want! How many toilets are there in Museum Niederösterreich? Are food and drink allowed in the museum? No, food and drink are not allowed in the Museum Niederösterreich display areas. Please use the designated refreshment zones in the foyer and by the Broad Pine. You are also most welcome to relax in the Pan Pan café restaurant, the culinary meeting point at Museum Niederösterreich. Who takes care of the animals in the Museum? Animal attendants look after the animals in the Nature Discovery section at Museum Niederösterreich. Their daily and weekly tasks include feeding and watering the animals and cleaning the terrariums and aquariums. We occasionally have baby animals, and these are reared by our attendants too. In addition, monthly tasks include, for example, cleaning the large in-house filters as well as those in the pond outside. 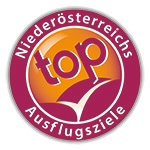 The person in charge of safety at Museum Niederösterreich is Reinhard Kern, authorized officer and Head of Facility Management. Is there a beverage vending machine at the Museum? How long has the museum been here? Is there one ticket for the entire museum, or do I need to buy several to include special exhibitions? The ticket you buy at the ticket desk in Museum Niederösterreich includes all exhibitions and displays in the museum. . Does the Café also close at 5.00 p.m.? Yes, the Pan Pan café has the same opening hours as the museum. Therefore it also closes at 5 pm. When does the exhibition in the “Klangturm” re-open? The exhibition in the “Klangturm” is closed permanently. However, you can still go up to the platform at the top. Is there a cash machine/ATM in the museum? No, there is no cash machine / ATM on the Museum Niederösterreich premises. Where is the nearest cash machine / ATM? The nearest cash machine / ATM is opposite the BILLA supermarket in the government district (“Haus 3”). Where is the “Festspielhaus” theater? The “Festspielhaus” is opposite Museum Niederösterreich. The main entrance is at the beginning of the Culture District. Please go back towards the road, straight ahead. Why aren’t I allowed to take large rucksacks or handbags with me? Large rucksacks and handbags are not allowed in the display area for safety reasons. You may stow your large bags or rucksacks in the lockers provided before you enter the display area, by the Broad Pine. The bags can be taken out or put back any time. You will receive a key from the attendant when your ticket is validated.